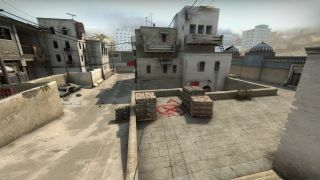 This year's catalog of GDC panels included some Counter-Strike: "Community Level Design for Competitive CS:GO" a series of words that are alarmingly up my alley. There was no way I wasn't missing a panel dedicated to competitive CS:GO, especially when retired Counter-Strike pro player Sal "Volcano" Garozzo and Shawn "FMPONE" Snelling (who we've featured previously on our site in the series "Building Crown") were doing the panelin'. I'm still writing up my notes and recorded audio from the presentation, which I'll share soon in a separate story. After the panel, though, I pulled Garozzo and Snelling in front of a camera to get them talking about the state of CS:GO's esports scene and the immortality of de_dust2, likely the most-played map in the history of gaming.